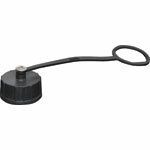 Waterproof IP67 rated 3 Pin Male Solder cup chassis connector for installations outdoors or in areas prone to moisture build up. Lock Type mating ring. 5A rated. 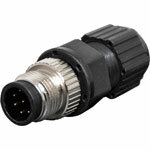 Male and female line connectors include metal screw on collars, with heavy duty plastic cable entries. Chassis connectors feature metal outer construction with plastic insert. Ideal for heavy duty industrial & marine applications. 5A rated. LTW M12 series. 8 pin line female connector Cable entry: 3 to 6.5mm. 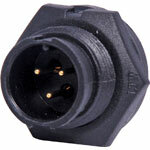 Male and female line connectors include metal screw on collars, with heavy duty plastic cable entries. Chassis connectors feature metal outer construction with plastic insert. 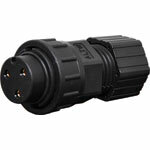 Ideal for heavy duty industrial & marine applications. 4A rated. LTW M12 series. 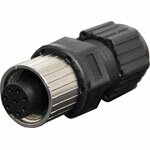 8 pin line male connector Cable entry: 3 to 6.5mm. 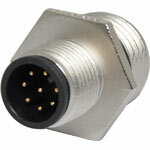 Connector dust cap to suit Screw-On Fem. Chassis PA9706A. 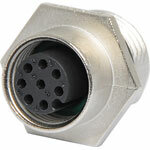 Waterproof IP67 rated 3 Pin female line connector for installations outdoors or in areas prone to moisture build up. 20A rated.